The name BEKA – is derived from the surname initial of the founders of the Beka Record G.M.b.H., namely Heinrich Bumb and Max Koenig, who had started in business in Berlin in about 1900 as merchants of Edison Phonographs and cylinder records. By 1902, Bumb and Koenig had established a business to market the ‘Zonophone’ talking machines and disc records, but with the acquisition of the International Zonophone Company by The Gramophone & Typewriter, Ltd., Bumb and Koenig set about carving their own niche in the disc record industry in the name of Bumb & Koenig G.M.b.H. In the later months of 1904, Bumb and Koenig – themselves – set out with a recording machine and travelled across Europe and down to Egypt and Turkey, – recording repertoires for their own disc record label. In March 1905, the BEKA RECORD was introduced with a catalogue of over one thousand recordings taken on the recording tour by Bumb and Koenig. The first BEKA RECORD releases were 8″ inch, 10″ inch and 11″ inch size discs with white and navy coloured labels, and used as it’s trade mark – a flamingo – depicted listening to a talking machine in parody of the dog listening to the gramophone. On 5th October 1905, Heinrich Bumb accompanied by Wilheim Hadert set out on a recording tour that was to circle the globe and produce hundreds of recordings to add to their catalogue. Bumb and Koenig had converted their company name to Beka Record G.M.b.H., based at 75-76 Heidelbergerstrasse, Berlin in early 1905, and were already acheiving some success in the marketing of their disc records, despite the fact that this two man operation was competing against such large corporate structures as The Gramophone & Typewriter, Ltd.: the International Talking Machine Co.M.b.H. (0DE0N RECORD): The Nicole Record Co. Ltd., (NICOLE RECORD) and other minor disc record companies. This ‘journey around the world’ took in stops for recording in Istambul, Cairo, Bombay, Calcutta, Rangoon, Bangkok, Singapore, Hong Kong, Tokyo, and then to the United States, returning to Berlin on 17th June 1906, having taken over one thousand recordings on the tour. To focus on Bumb and Hadert’s activities in India: the Beka recording team arrived in Bombay on 17th November 1905, and settled into Watson’s Esplanade Hotel, Bombay. Valabhdas Runchordas and Lakhmidas R. Tairsee were engaged as ‘brokers’ for the Beka Record G.M.b.H. Runchordas and Tairsee had established The Talking Machine & Indian Record Co., at the corner of Churchgate Street and Tamarind Lane, Fort, Bombay, in December 1902, to market Edison, Pathe and Columbia phonographs, and by late 1905 had become what has been referred to as ”the largest talking machine business in the far East”. Some recording were taken in Bombay, after which the Beka recording team travelled by train to Calcutta where more recordings were taken with the assistance of their ‘broker’ Abdul Hamid Ghaznavi, a prominent Muslim leader and business-man. From Calcutta, Bumb and Hadert travelled onto Rangoon, then to Bangkok, and onto Singapore, Hong Kong and Tokyo, recording all the while – eventually returning to Berlin by mid-June 1906. As a result of the Beka Record G.M.b.H. recording tour, some three hundred and thirty single-side disc records were issued of Indian repertoire. 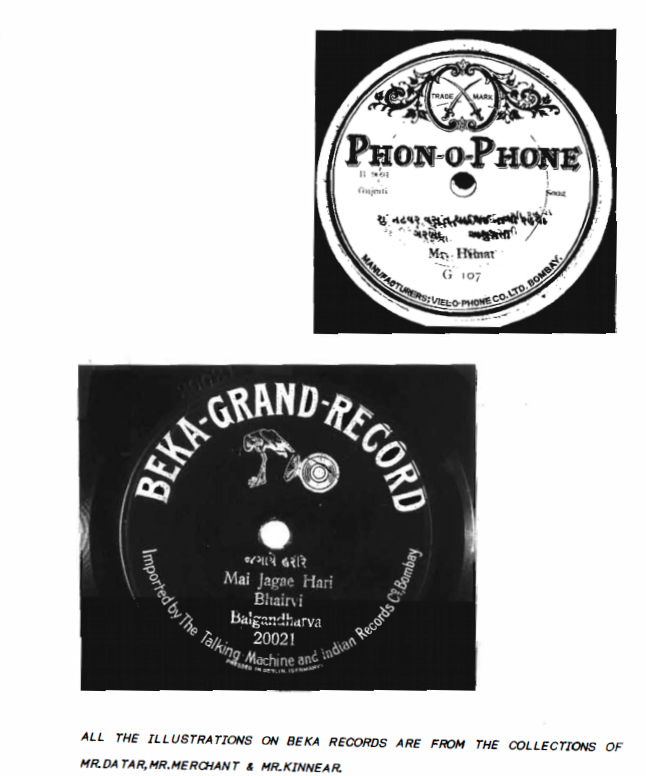 The release of the ‘BEKA RECORD’ (8″) and BEKA GRAND RECORD (10″) discs represents only the fourth such venture into disc record marketing in India – following The Gramophone & Typewriter, Ltd. – in December 1903, and again from December 1904 to April 1905, and The Nicole Record Co., Ltd., November 1904 to March 1905. In December 1906, a further Beka recording tour of India was begun at Bombay under the leadership of Ernest Lowe, a director of the company. Recordings were taken at Bombay, Lucknow, Benares and Calcutta, before moving onto Rangoon, Bangkok and Singapore as was the usual practice of recording companies at the time. 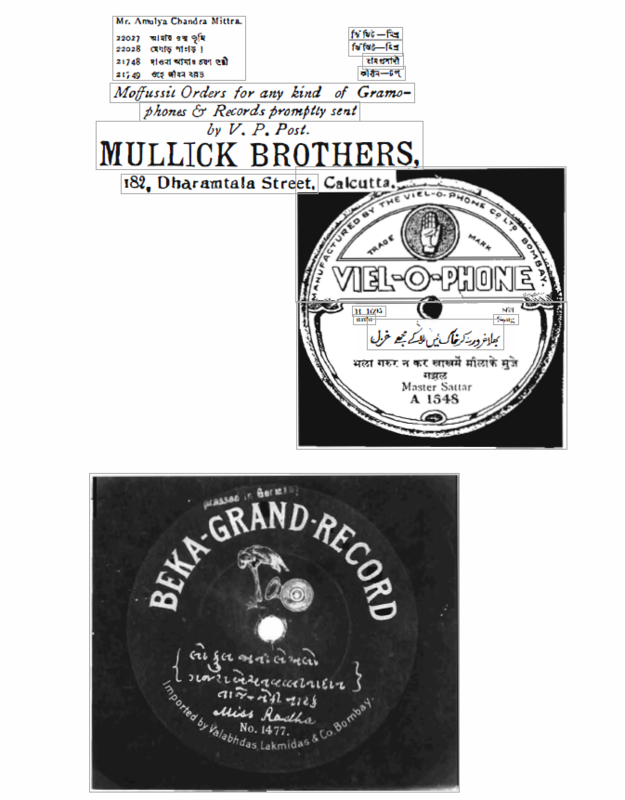 With a catalogue of several hundred recordings in their Indian repertoir the ‘BEKA GRAND RECORD’ offered great competition to the “Gramophone” catalogue – so much so that The Talking Mahine & Indian Record Co., of Bombay with branch offices in Calcutta, Delhi, Madras and angoon, had become the paramount disc record distributers in the major citieso f India and were – for a time – appointed the wholesale agents of The Gramophone & Typewriter, Ltd., in Bombay, before that company had set up their own branch office in that city. 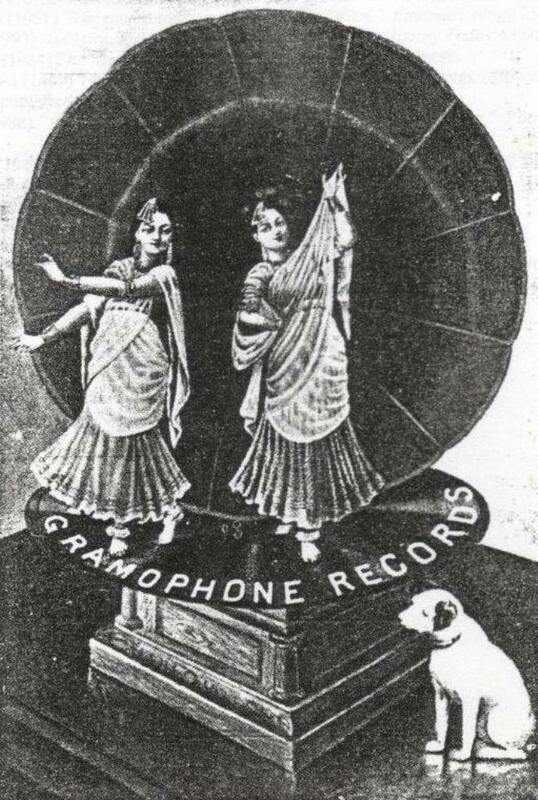 The Gramophone & Typewriter, Ltd., in Bombay, before that company had set up their own branch office in that city. The opening of The Gramophone Co’s record factory at Sealdah, Calcutta, in mid-1908, might well have discouraged the Beka Record G.M.b.H., from attempting to continue with the Indian disc record market, being based in Berlin, the supply of disc records to India was dependent on ready availability of product, and although The Gramophone Co., certainly had the advantage of being able to manufacture the disc records locally, the aggressive marketing policies and network of dealers engaged by The Talking Machine & Indian Record Co., ensured a steady supply of the ‘BEKA GRAND RECORD’ for the record buying public. In June 1910, another recording tour of India was undertaken by the Beka Record G.M,b,H,, which continued through to early 1911. 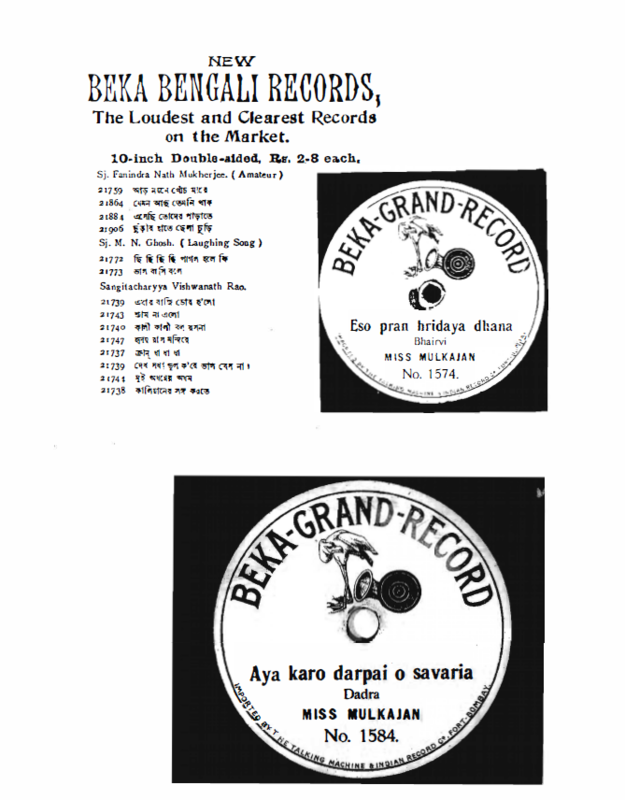 By this time the ‘BEKA RECORD’ (8″), and ‘BEKA GRAND RECORD’ (10″) were represented by a catalogue of some three thousand recordings on the market in India. In July 1910, Beka Record G.M.b,H., was merged with Fritz Puppel G.M.b.H., of Berlin, to form Beka Record A,G, and a month later tbe Beka/Puppel merger was amalgamated with Carl Lindstroem A.G., controllers of the ‘ODEON RECORD’. 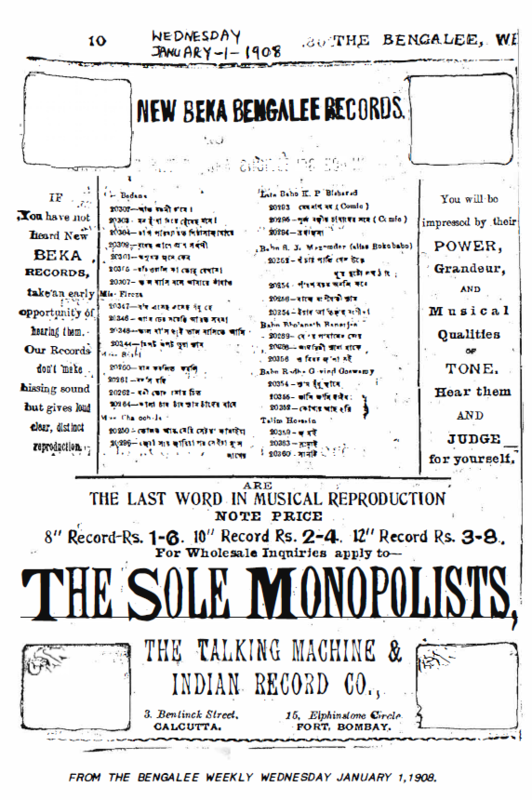 This action might have spelt an end to the activities of the Beka Record Co’s representation in India, but instead, The Talking Machine and Indian Record Co., became stronger by the representation of the BEK.A RECORD, ODEON RECORD, and JUMBO labels, trading with the sub-name of “The Beka Record Agency”. In October 1910, the SUN DISC RECORD was placed on the market in India at the low price of 2 rupees per double-sided disc, to which The Gramophone Co., responded with the release of the ‘ZONOPHONE RECORD’ at the same price. Not to be left out The Talking Machine and Indian Record Co., joined the low-price record market with the ‘PHON-0-PHONE’ record, – manufactured in Germany – which essentailly was little more than a re-release of previously issued ‘BEKA GRAND RECORD’ titles that had fallen off in sales. Unfortunately no comprehensive ‘BEKA GRAND RECORD’ or ‘PHON-0-PHONE’ record catalogues have been found to verify the releases and re-issues on each of these labels. Although the ‘BEKA GRAND RECORD’ maintained a high profile in the Indian disc record market, it was displaced in priority with The Talking Machine & Indian Record Co., by the ‘ODEON RECORD’, which had become this company’s leading label, as a result of the amalgamation mentioned above. From 1913 onwards, although the ‘BEK.A GRAND RECORD’ continued to be marketed in India, until the outbreak of World War One, the label had seen better days. By early 1914, the number of ‘BEKA GRAND RECORD’ releases still in the catalogue numbered less than one hundred out of the three thousand plus titles that had been recorded since October 1905. 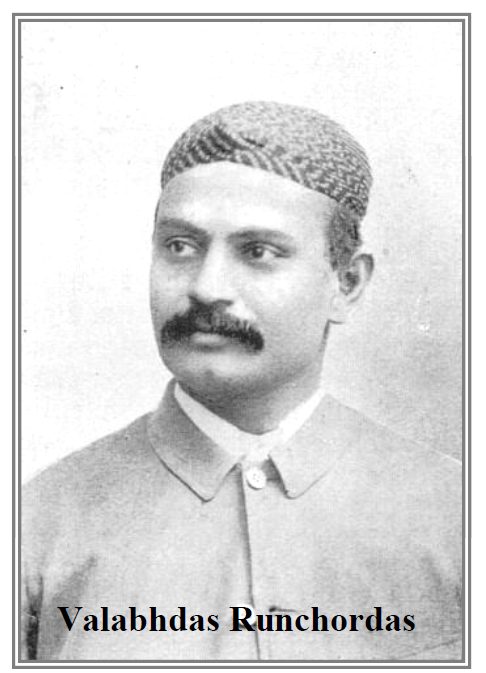 The re-percussions of the outbreak of World War One were particularly severe on The Talking Machine & Indian Record Co., for Valabhdas Runchordas had been tied to German recording companies since 1906, and as the labels that he represented were all made in Germany – his source of supply was cut off during the war years. 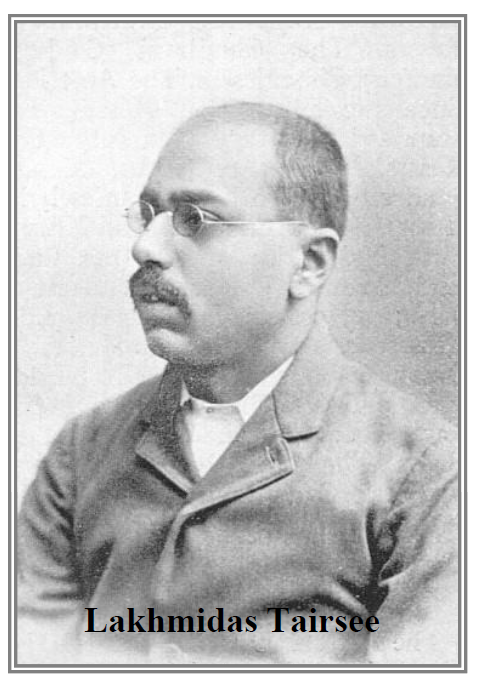 India, then being a part of the British Empire, had banned any trade between Germany and India, and left Valabhdas Runchdas no other alternative than to set up his own disc record factory – if he wished to continue in the trade. In 1914 Runchordas went on a world tour seeking to acquire product and equipment with which to continue his activities in the record industry of India. Runchordas was successful in acquiring some matrices from German sources, including the matrix stocks of the ‘SINGER RECORD’ that had been on the market in India during 1910 and 1911, and may have acquired some Beka matrices also. Although Runchordas had strong business ties with English, German and Swiss companies, he had to turn to Japanese suppliers for his disc pressing machinery. By early 1915, Valabhdas Runchordas had broken off his business partnership with Lakhmidas Tairsee and set up another company in the name of The Viel-o-phone Co., Ltd., in the compound of his residence, complete with a record pressing plant, at “Infinite”, Mogul Lane, Mahim, Bombay. From his record pressing plant at Mahim, Valabhdas Runchordas went into manufacturing disc records with the ‘VIEL-0-PH0NE’ and the cheaper priced ‘PH0N-0-PH0NE’ labels – of which the later may have contained some ‘BEKA GRAND RECORD’ titles. He also manufactured the 5″ violet BABY RECORD. The ‘BEKA RECORD’ (8″), and ‘BEKA GRAND RECORD’ (10″) disc records have catalogue and matrix numbers which are identical, From the printed label the number given is the same as the matrix number, but with further inspection of the markings on the disc surface it may be seen that the matrix numbers on several of these ‘BEKA RECORD’ and ‘BEKA GRAND RECORD’ discs have a suffix letter – such as 􀂇M, or -A, appended to the number. The significance of this suffix letter is not known, as are some of the “squiggly” markings on the disc beneath the paper label. 􀂒hether the matrix numbers are in sequence or not is also not known, but it may be safe to assume that the matrix numbers – at least as far as the 1905 recordings are concerned – are in sequence. The early Beka recordings of the Indian repertoire are numbered between 1425 through to about 1750, at which number some Burmese recordings are known, which ties in with the report by Heinrich Bumb that some three hundred and thirty recordings were taken at either Bombay or Calcutta during the 1905 recording tour. 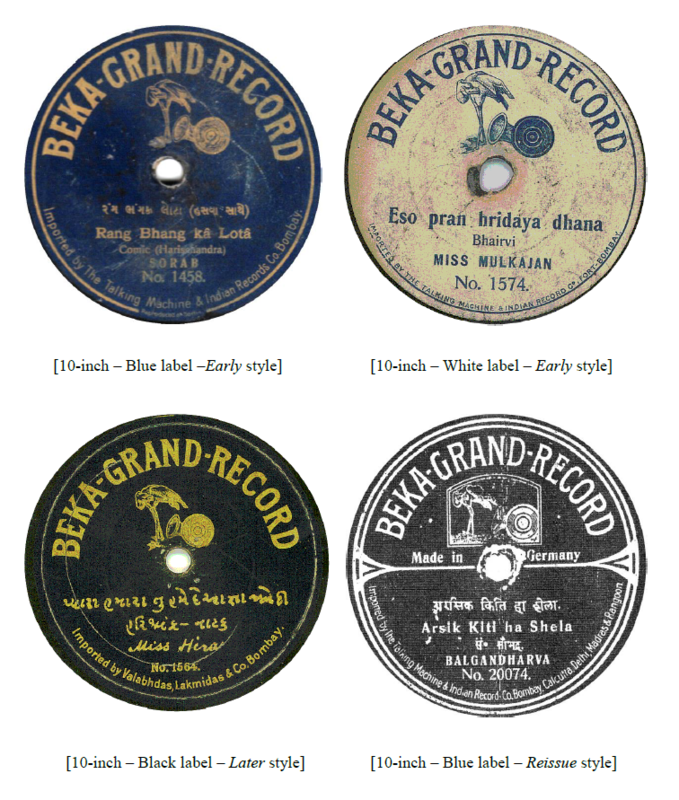 The first releases of the Indian repertoire on ‘BEKA RECORD’ and ‘BEK.A GRAND RECORD’ were single-side recorded discs with white or navy coloured labels, These white labelled ‘BEK.A RECORD’ (8″) and ‘BEK.A GRAND RECORD’ (10″) discs are quite rare – and the same titles may also be found with navy coloured labels with gold printing, but there is little doubt that the white labelled discs were manufactured prior to the navy coloured labels as the pressings are also of a ‘cruder• quality than the navy coloured labels of the same titles. In 1908, those titles which had remained popular with the record buying public were re-issued as Double-sided discs – without any change to the label style. There is some confusion created by a 1914 ‘0DE0N RECORD’ catalogue – which contains not only Odeon recordings but also Beka recordings, in the 2500 numerical range. These numbers may refer to 7\ inch or even 12 inch ‘ODE0N RECORD’ releases – or may be numbers that fit into the ‘BEKA GRAND RECORD’ sequence of numbering. The catalogue does not define whether these are ‘BEKA GRAND RECORD’ 10″ discs or 12″, 10\” or 7\” discs which could be ‘ODE0N RECORD’ releases – either way these number could fit into the known numerical sequence of both labels. With the recordings from the 1907 recording tour the ‘BEKA GRAND RECORD’ nunerical system for the Indian repertoire moves directly to 20000 right through to 22000 plus – indicating the release of some two thousand titles on the ‘BEK.A GRAND RECORD’ label, The highest known number being 22028 -a recording by Mr. Amalya Chandra Mittra – in Bengali – presumed to have been recorded at Calcutta in 1911. It is not known if this numerical block was filled – but it is known that the 23000 and 24000 series were used for ther “Oriental” series. There are also some ‘early’ BEKA RECORD issues of Cantonese recordings numbered in the 20900 range of numbers which suggests that this ‘block’ was not reserved – exclusively – for the Indian repertoir. An unusual Beka recording which was not issued as a ‘BEK.A GRAND RECORD’ – but on a special “NATIONAL” GRAND RECORD features Babu Surendranath Banerjee, the then editor of “The Bengalee” – reciting two “nationalist” songs. Sometimes records in the 20000 and 21000 series are found with a G­ prefix to the catalogue number – but not always. From late 1908 onwards new releases and the earlier releases which were still popular were given a double-face series number – some have D-, others E- or O-, which signified the selling price. These double-face series numbers may be found on seve􀄵al discs, but there have also been examples found -issued late in the series which do not have the double-face number. Thus it is possible to find a ‘BEKA GRAND RECORD’ issued as a single-side recorded disc, double-sided and also 􀅌ith a double-face series prefix letter and nunber. In early 1906, Beka Record, G.m,b.R., published an “International Catalogue” of 224 pages which was available “gratis” to their dealers, and included all of the Beka records issued to date including those in several European languages along with releases in Arabic, Chinese, Turkish, Malay, Tamil and ‘Hindustanee’ (Urdu, Marathi, Gujarathi, Hindi and Tarsi). No copy of this catalogue has yet been found to verify it’s contents, other wise we might well have a lot more data about the ‘early’ releases of the Beka records. The final releases of the Indian repertoire appear to have taken place in about November 1912, listing new releases and reissues under their Double-face series numbers of which D-870 appears to be the highest number known. To further complicate matters, it is known that the Double-face numerical system also includes the ODEON RECORD labelled discs that were still on the market and that the Double-face numerical series runs to 3300 plus. Considering this aspect of numbering the BEK.A GRAND RECORD and ODEON RECORD issues in the same series, and the fact that very few BEK.A GRAND RECORD’s have been found with a Double-face number, it see.ms more logical to annotate the ‘Beka Record’ issues by their single-side number along with the coupling nwnber for the reverse side of the Double-sided discs. Collectors of GRAMOPHONE CONCERT RECORD and HIS MASTER’S VOICE records may be interested to search out BEKA GRAND RECORD’s by the same artists performing the same songs or instrumental pieces. In this regard, Malka Jna, Bedana Dassi, Ushabala Dassi, Tali.m Hussain (Sanai) and Mohammed Yakub (Yakub Khan – Harmonium)) amongst many others provided similar recordings for both the ‘Gramophone’ and ‘Beka’ companies, and possibly other record companies as well. The 8″ and 11″ or 12″ size Beka labelled discs also shared the same numerical sequence of numbering with the 10″ size, although the number of releases on these other sizes are comparitively few. Apart from some of the earliest releases in the Indian repertoire that had white coloured labels, all other releases in the repertoire had navy coloured labels with the ‘flamingo’ trade mark. For other Asian releases such as the Burmese repertoire, the labels have various colours and a ‘peacock’ trade mark, while releases in the Siamese repertoire have also been traced to the KATZ BROTHERS, LTD,, (Sole Agents) with a red coloured label featuring an ‘elephant’ as it’s ‘trade mark’, and titles in other Asian repertoires have been found with the label as ‘TJAP BINTANG SAPOE’ (collected stars record) later modified to PENDAPATAN BAROE (hidden mask). The use of this label appears to have been utilized by the European exporter, L.S. Solomonfon of Rotterdam, Holland, for the Dutch East Indies, and South East Asian territories. Any ‘BEKA RECORD’ (8″) or ‘BEK.A GRAND RECORD’ (10″) or 12″ record is collectable – particularly the earliest single-side recorded discs in the 1425 to 1750 numerical range and the 8″ size discs. Their value is added to by the fact that the pressings of these disc are usually of a high standard for the time, and more so in that they contain recordings of artists – such as by Bal Gandharva, Purshottam, Miss Malka Jan, Murad Ali, Sohrabji R. Dhondi and which were amongst the first disc recordings of these performers. This entry was posted in INDIA and tagged Beka Grand Record, Beka Record, Beka Record GMbH, Bumb and Koenig., Michael Kinnear - Discographer, Michael Kinnear- Researcher, Phon-o-Phone by bajakhana. Bookmark the permalink.